I was born in the Bronx, but raised in upstate NY. I graduated Washingtonville HS in 1970 with Art Club & Most Artistic Senoir awards. After graduation, I became a Nomad for 6 years traveling the country in my 66VW bus. In 1976 I opened Simple Signman art studio in Sugarloaf, NY. In 1979 I earned an Associates Degree in Commercial Art from Orange County Community College. In 1982 I bought a handyman special home in Midtown Kingston, NY & opened the 'OFF-BROADWAY GALLERY'. 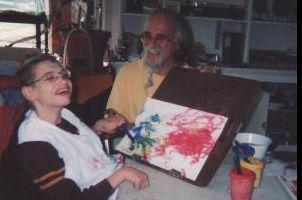 In the early 90's I did an Independent Study in Art Therapy through Empire State College. In 1991 I opened 'AIR (Artists-In-Residence) STUDIO GALLERY' & continue to run it as an Artists Cooperative making the space available to Artists, Writers & Musicians for music, readings & art events. I love to draw, paint & combine mediums. I enjoy photography & video, also. As a Father of 5 I enjoy working with children in my Art Fun for Kids program & have worked extensively with Special Needs Kids from several Ulster County & Social Service programs. Help make the world a more beautiful place, SUPPORT THE ARTS! Draw, Paint, Cut and Paste, for all ages! Art Fun for Kids combines art education & art therapy techniques to foster developmental & emotional growth. The fundamentals of line, form & color provides a firm foundation for learning to read & write. While the creative process also promotes mental health by enabling participants to vent feelings in a positive, healthy, non-threatening environment. My child centered approach focuses on the needs of each child & allows them to explore their individual interests. They're encouraged to experiment in various mediums including drawing, painting, collage, mono-prints, paper mache.